Are you heading out boating, camping or to visit your favorite cabin? Thanks to our Essential FreshSeal™, you can take our artisan organic Take & Bake bread with you on any adventure you and your family decide to embark on this summer. You can bake Take & Bake in the oven, on the grill, camp fire and even toast it by the slice. Whether you are going on a trip or entertaining at home, this simple dipping oil can make a great appetizer or a part of a full meal. It can be drizzled or brushed on both sides of a loaf cut in half, or simply cut or tear off baked pieces of bread for dipping. You could even use it over pasta or as a salad dressing. It can be made ahead of time and packed on the go. Add the olive oil and garlic into a medium sauté pan, gently heating over medium heat for about 3-4 minutes or until fragrant. Remove pan from heat and let cool. Add in the finely chopped parsley, oregano, and capers to the cooled garlic oil. Slice the loaf of Take & Bake in half horizontally and spread the mixture on the halves of bread. Wrap in foil and place the bread in the oven and bake 5 minutes. Open foil and bake for an additional 5 minutes. 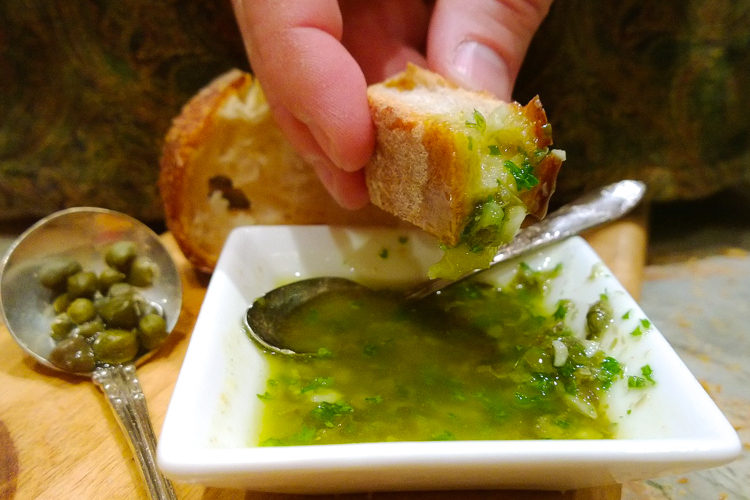 Or serve Garlic Caper Oil as a dipping oil for hot Take & Bake bread. The oil can be stored in a container in the refrigerator for up to a week. Irresistible‎ Peach Croissant & Blueberry Croissants Available Now! Ben & Jerry's Whoopie Pie For Free!